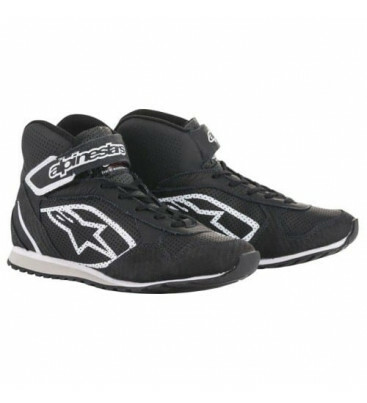 Alpinestars Radar boots. Originally developed for professional service and pit crew mechanics, these boots are also suitable for co-drivers wanting more substantial footwear, with better comfort than slim fitting racing boots. They feature a full leather upper including carbon leather in the heel and toe areas for increased abrasion resistance and durability. The extra wide sole was developed for increased traction and offers super stability for the wearer, with the addition of trategic perforated zones for cooling and soft EVA ensures super comfort when worn for prolonged periods.